If you are a blogger fussy with appearance of your blog, or you get involved in activities like Blending colors of your advertisements with the colors of your website or Blending color of your search box with the colors of your website or Change main background color of Rounders template blog, you will have to be familiar with hexadecimal HTML color codes. HTML color codes are codes with a # in front of either 3 or 6 alphabets or numbers or combination of them. An example is #FFFFFF which is the HTML color code for white. It can also be written as #FFF. Of course those with 6 alphabets or numbers or combinations will have a greater range of colors than those with only 3. 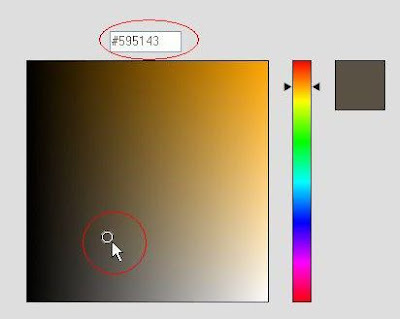 There are various ways of getting the HTML color code you want. The red arrow shows where I clicked on a color on a color bar. The HTML color code is highlighted by a red ellipse #815D19. Not that the large square display slight variations of that range of color (all various shades of brown) and the tiny circle which is the shade of brown you selected. 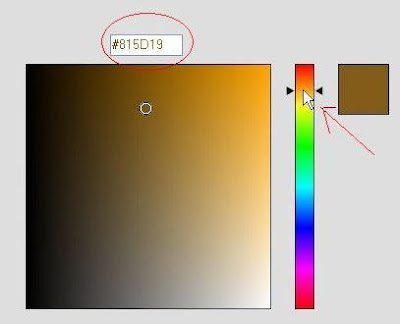 The actual color represented by the HTML color code #815D19 is shown in the small square on the left. Note that this time I clicked on a different area of the large square on the left indicated by a tiny circle plus the arrow representing the mouse cursor and further highlighted by a red ellipse. The HTML color code is now #595143 (highlighted by another red ellipse and again the actual color chosen is displayed in the small square on the left. Note that I have clicked on the lower (blue) section of the color bar (cursor shown as a white arrow highlighted by a red arrow. 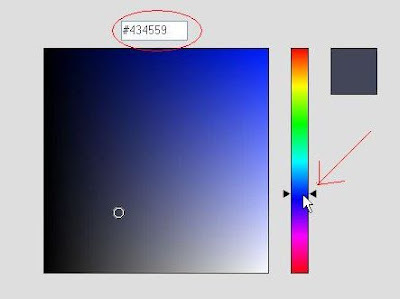 This time the HTML color code is #434558 and the shade of blue is shown by a tiny circle in the large rectangle on the left and the actual color displayed again in the small square to the right. Just as above, if you are not happy with this shade of blue, just click on the appropriate point in the large rectangle on the left and you will get a different shade of blue, and so on. I used the Haloscan commenting system in one of my blogs Natural Remedies because someone asked and I need to get some experience so that I can respond. However, I have been having problems because I set the comments for moderation, but each time I get an email notification, click on the link, I get to a page to post a comment. 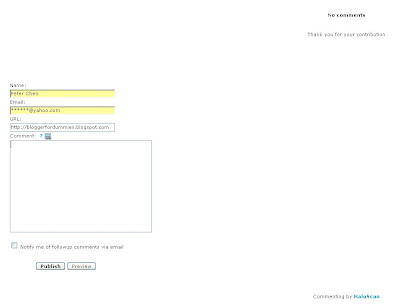 This has been going on for some time, but I got another 3 Haloscan comments to approve. This is the last straw, and I will have to take time off from my other tasks to take care of this one first. Maybe it is because I am quite satisfied with the Blogger commenting system and don't care so much for the Haloscan system, and probably there is something I don't know. If any of you happen to be using Haloscan system, and you can provide some useful feedback, will highly appreciate you leaving them in the comments (Blogger commenting system for this blog). I have Posted a comments It was not published yet. This is for me to post a comment, not to approve or reject a comment!!! I don't have much time to go learn how Haloscan commenting system works, so I give up. If you have some good tips, please leave them in the comments (Bloger, not Haloscan). Will be highly appreciated by me plus this blog readers. The majority of HTML tags occur in pairs, an opening tag and an closing tag. Example, the opening tag for an unordered list is <ul> will be followed by a list, and at the end of the list, you must have the closing tag </ul>. However, some tags do not need a closing tag. Examples are the line break tag (to force a line break) <br /> and the image tag <img src="photo URL" />. These tags do not need a closing tag, but they have a space followed by a backslash / at the end. In HTML, Meta Tag definitions do not need to be closed with </ (Added by author of this blog: I believe when is meant by </ is a closing tag </any closing tag>), however you should not include any line breaks in your declaration of the Meta Tag as this can cause your web page to be incorrectly read by the search engine spider programs. So what the author of that PDF book is saying is meta tags do not need a closing tag. However, please not that there is a difference between HTML and the newer XHTML (we should all try to follow XHTML now). In HTML the <meta> tag has no end tag. In XHTML the <meta> tag must be properly closed by putting a space followed by a backslash /, that is <meta />. Note that if there are other attributes after meta, the space and backslash must come after all the attributes and should be at the end of the tag. My take on tag without a corresponding closing tag in XHTML kind of close itself by add a space followed by a backslah / at the end of the tag. There are still bloggers who use the old classic Blogger template, some because they have too much customization and too attached to it, and some because they choose to use custom domain and host on their own. Got a guestion on how to add adsense text link ad in below some specific posts. You cannot add AdSense ads only below the post you choose. There is a way to add ads below the post, but you cannot pick and choose. Blogger will choose for you. Generate the script from your AdSense account and copy-paste below this block of script. Preview, and if satisfied, click "Save template". If you have any difficulties in finding those codes, copy part of the codes, press CTRL+F, then paste them into the "Find" field in the task bar at the bottom of the page. Responding to a blogger question "What is a homepage?" 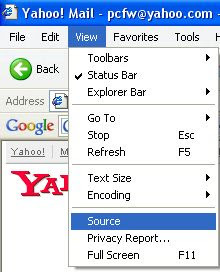 into the address bar of a web browser like FireFox, my favorite web browser, Internet Explorer, Opera, Flock, etc., and pressing the ENTER key. What is displayed in the homepage of a blog is a number of the most recent posts (Blogger display the latest posts first and this chronological order cannot be changed to display the oldest posts first, but can be done with other blogging platforms). Then number of the most recent posts displayed in main page is by default 7 posts, but can be changed. See Changing settings of New Blogger blog. The characteristics of a blog (or weblog) is the existence of the main page, the archive pages and the individual post page of a post (permalink). You can click on the archive of any particular month in the ARCHIVES in the right sidebar to see all the posts published in that month. How to make permalink more prominent. That post originally exists in 3 separate pages - the main page, the archive page of that current month during which the post was published, as well as its individual post paage (permalink). As you continue to publish new posts, they will displace the older posts from the main page until they no longer exist on the main page, but only in an archive page (of the month it was published) and the individual post page of the post. Hopefully this post will make clear to you what are the characteristics of a blog or web log. The fastest way to get indexed (to have information about your site in the search engine database) and to be "findable" or "searchable" by search engines is to get a link from a website that already has been indexed and regularly spidered (crawled or having a kind of robotic program that enables search engines to read what is in your website), preferably by a high PageRank website like this one whose main page (home or index page) (click BACK button to get back to this page) has 6 (at time of publishing. There is such a thing as what they call Google Dance, that is, PageRank of a site changing with time.) If you want to know how to get the PageRank of your own and other sites, refer to How to get the PageRank of your blog or any other website. Note that the actual PageRank used by Google search engine may not be exactly the same as what you get via this method as Google takes some time to update it, but it is a very good guide. into the search box above, tick the radio button ( ) beside WEB and press the ENTER key and you should that there are results. If you see no result, please alert me by leaving a comment and I will have to check what is wrong. into the search box above, tick the radio button for WEB and search. No result - not indexed yet. If you get some results, your site is already indexed. I have many blogs, and if you are in a hurry, you can contact me via the "Click here to contact me" link near the bottom of the left sidebar and I will see if I can help. Note that normally your blog or website will eventually be indexed even if you do nothing, but your site may rank very low in search engines. When surfers search for topics relevant to your site, that is, whatever they are searching for is contained in your site, the link to your site in the SERP (Search Engine Result Page) may be buried so deep in it you will not see it, but it is there. A blogger asked, so here is the answer. 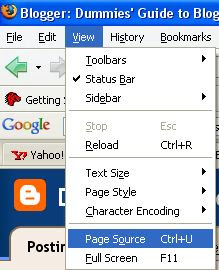 When you click "Page source", a new window will open with the source code used to display that web page. 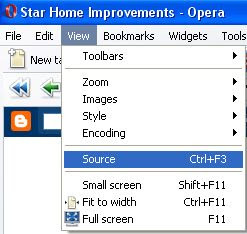 Actuall, the option says "Page source ctrl+U" which tells us that there is a keyboard short-cut. When you press the control plus U keys simultaneously, you will get the same result, but I prefer the above. Same as for FireFox browser. Not surprising as Flock is based on Mozilla FireFox.